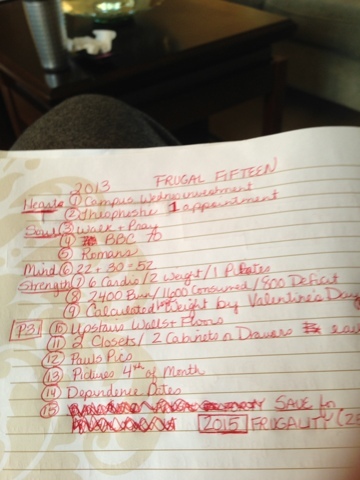 2013 Goals - The "The Frugal Fifteen"
The word for the year is FRUGALITY - that bears fruit! 15. 2015 frugality for 25th anniversary save for trip! Fingers on the keyboard, and I will not let them stop for fifteen minutes. Feeling so alive this morning. I have lost 2.2 pounds and my back feels FANTASTIC. It really has helped to STOP RUNNING. The extra calorie burn was NOT WORTH IT because of the days I would have to spend in bed recovering and being lethargic because of the pain. I am pain-free, and I have been since Dr. Koen adjusted me after I STUPIDLY RAN after the Number 7 bus from the Downtown Transit Center to 9th and Monroe, and MISSED IT! ACK! My back will still go out when I do things like that, especially when carrying Christmas presents in my hands. NOT SMART! Several years ago, I started a FACED accountability group after having followed this for myself for years. ACADEMICS or ATTITUDE - I like to keep growing in my love of literature, art, music, etc. Others report their attitude for the day. COMMUNION with God and people - the center of it all! It is well with my soul. The season was lovely. I had a good balance of time with God and time with people. We missed one party. So, for the first time in years, we didn't go caroling, but we had such lovely time around the advent wreath, and I loved my "Messiah Meditations" over the last week. When I first started trying to listen to this in 2010, I thought: BORING! The narrator sounded very stuffy, and it went on about Italian Oratorio and all that, but I gave it a second try Christmas season 2011. I sat down and really listened to it. It is a WEALTH of insight and information about this masterpiece! I loved it. If you are a Messiah Geek like me, it will benefit you greatly to understand the ins and outs of this gift from Handel! If you are not a Messiah geek, it may be a bit too academic, but I listened to it again this Christmas, and I found myself wanting to write down quotes. I listen to a little of the book and then the part of the music he has just described. I love that I go to bed and wake up with these Scripture songs in my head during the Christmas season because CHRIST is what the season is all about! It will be my annual tradition! Update: I read the print in 2013, and I like that much better! 4) Least favorite book of 2012 and why? Steppenwolf - It is just a yucky book. Strange. I don't care if it is a classic. The Bluest Eyes is a close second. 5) One book you thought you'd never read and was pleasantly surprised you like it? 6) One book you thought you'd love but didn't? After reading contemporary Christmas stories that lacked brilliance, it was so nice to come home to a bright and shining classic of American literature! It was a great way to end the year of reading. While this story doesn't qualify as a "Christmas book," the story starts out with the four March girls lamenting the fact that they were too poor to truly enjoy Christmas. Many of the major movements in the book do happen around this holiday. Since I make up the rules on the "December of Christmas reads," this officially qualifies now. Love has got everything to do with it. Love this analysis of 1 Corinthians 13 by the Scottish evangelist, Henry Drummond. I listened to the LearnOutLoud.com audiobook by Seth Anderson. The Greatest Thing in the World is taken from an address Henry Drummond, a Scottish evangelist, delivered to a gathering of friends in England in 1884. It is based on the 13th chapter of First Corinthians (the Love chapter). I am not done with this because the devotional goes through January 6, but it is FREE now. See the link below. I don't know if it will free when I finish it on January 6. So, I am posting it today! NOTE: I finished it December 27th. I couldn't wait until January 6th! So good. Very rich. Endomondo Exercising Workout: was out exercising 5.00 miles in 32m:16s using Endomondo. I feel so GREAT! I finally had a day where I recorded all my food and had a calorie DEFICIT. Actually, I got on the scale this morning after not having my weight recorded since August. I don't usually look at the scale at the doctor's office, but they gave me a sheet (Dr. Sharp, my new doctor, is really into preventative medicine) with my weight on it then. I had only gained three pounds since August. So, it isn't as bad as I thought. I am six pounds overweight, but I like to be much lower than what the "top of my range" says. Continuing on my quest to get through Christmas books given to me over the years, I give you The Christmas Sweater. It was OK. There are a few twists and turns, and it is semi-autobiographical. It could have used some editing in some places and some expansion in others. There was so much time setting up the story prior to the climax that the ending seemed really rushed. Then, there wasn't enough development of some of the characters. I am not sure I liked it. It was just OK. I know it was just OK because I read two Lucy Maud Montgomery Christmas short stories immediately following, and I was delighted. It isn't a bad book though. Just not up there with books of really, really good authors. Sandwiched between Dickens and Montgomery, Beck did not have a prayer. I could have sworn I already wrote a review of this, but I cannot find it in my list of posts. Remember last week when I talked about the tradition of telling "ghost" stories on Christmas Eve during the Victorian Era? This is the quintessential ghost story, and I had to redeem my respect for Dickens after reading his short stories that I reviewed last week. This book does not disappoint. I read it once for my book club and once to my children as a read aloud, but that was probably more than ten years ago. I had never listened to it, and this NAXOS audio version has the best narrator AND classical music in the transitions. It is a TREAT! I checked it out on my Library2Go.com account. THE BEST! My respect (and love) for Dickens has been restored. BY THE VERY REV. HUGH POPE, O.P., S.T.M. AUTHOR OF "THE CATHOLIC STUDENT'S 'AIDS' TO THE BIBLE," ETC. WITH A PREFACE BY VERY REV. VINCENT McNABB, O.P., S.T.L. R. & T. WASHBOURNE, LTD. The entire Summais about 3,000 pages long, and most of it is Scripture so I would rather just read the Bible to get my theology, but Aquinas' work is so influential in Western thought that I needed to at least read a book like Kreeft's that is an anthology of the Summa using Aquinas' actual words. Kreeft also has a Summa of the Summa that is 500 pages, but I opted for this even more concise version that is under 200 pages. It is not "about" the Summa but gives the most important parts in a concise readable form. I figured this was enough to "count" for my Invitation to the Classics List! I think I will do a "Well" Update since I have not done for quite some time. I am just going to combine these two this time. When it is well with my soul, my emotions are also doing great. It is well with my soul. I love being in Romans, even though it has taken me FOREVER to get through Romans 11, and I have struggled with how to communicate it. It is a great struggle. I am praying through the whole thing, wrestling with Paul's words.